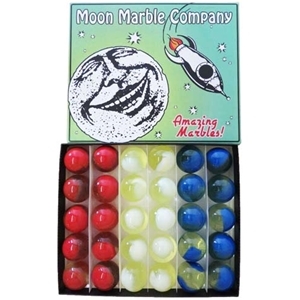 These are beautiful red, white, and blue patch style marbles. The base of these marbles are made with glass that contains Uranium Oxide. Put them under a black light and watch them glow. Colors may vary based on availabilty. Warning! : Choking Hazard. This toy is a marble. Not for children under 5 years.